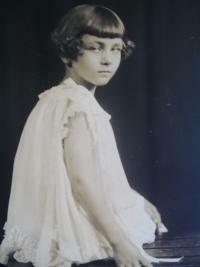 Shirley M. Mitchell appears as Shirley Mitchell, age 7, in the censusin the household of John Joseph Mitchell Jr. as his daughter. [S1294] John J. Mitchell household, 1940 United States Federal Census, New Haven County, Connecticut, population schedule, Milford, ED 5-122, sheet 64-B,shows father of Shirley M. Mitchell as John J. Mitchell. [S1294] John J. Mitchell household, 1940 United States Federal Census, New Haven County, Connecticut, population schedule, Milford, ED 5-122, sheet 64-B,shows mother of Shirely M. Mitchell as Margaret M. Mitchell. [S286] John Mitchell household, 1930 United States Federal Census, New Haven, Connecticut, population schedule, Waterbury, ED 225, sheet 8A, dwelling 145, family 165, shows age 7 and birthplace as Connecticut. [S1294] John J. Mitchell household, 1940 United States Federal Census, New Haven County, Connecticut, population schedule, Milford, ED 5-122, sheet 64-B,shows age 18 and birthplace as Connecticut. [S159] Shirley M. Trapp, 043-18-2077, Social Security Death Index, 1935-2014,, shows her birthdate. [S755] Phone conversation, John Mitchell, 3 July 2008, gave birthplace as Waterbury. [S871] "John Mitchell's Notebook,", shows Shirley Mitchell 4-17-22. [S745] Milford Connecticut City Directory, Shirley M. Mitchell, 1951 (Section M, Page 411). [S157] CT Death Index, 1949-2012, John H. Trapp Jr, 20525, 11 September 1997,shows married to Shirley. [S871] "John Mitchell's Notebook,", shows Shirley Mitchell 4-17-22 married John Trapp 5-29-51. [S157] CT Death Index, 1949-2012, John H. Trapp Jr, 20525, 11 September 1997. [S159] Shirley M. Trapp, 043-18-2077, Social Security Death Index, 1935-2014,. [S784] John Mitchell, "John Mitchell's Family Group Sheet", shows full deathdate.